Timothy Shenk is a co-editor of Dissent and a fellow at New America. He is currently writing an intellectual history of American democracy and has recently published an article titled, "Hannah Arendt’s Answer to Paul Berman on the Contemporary American Left." Shenk's article was highlighted in a recent edition of Amor Mundi, the weekly blog published by The Hannah Arendt Center at Bard College. 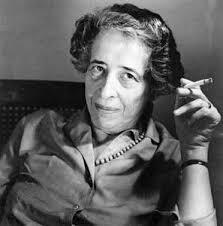 After running through a brief history of modern Europe, Arendt’s narrative brings her to one of the most puzzling questions of the interwar period: Why were vulgar demagogues peddling ridiculous doctrines able to turn millions of people against the liberal order? She had, by then, already discussed the psychology of what she sniffily referred to as “the mob,” and now turned her attention to totalitarianism’s attractions for the elite. What especially interested Arendt, who turned 27 the year Hitler became chancellor of Germany, was its appeal for younger intellectuals. Her answer centered on the failings of the status quo. “What the defenders of liberalism and humanism overlook,” she observed, was that it had become “easier to accept patently absurd propositions than the old truths which had become pious banalities.” Why was that? Well, people had eyes. They could see that elites who proclaimed themselves champions of civilization were “parading publicly virtues which [they] not only did not possess in private and business life, but actually held in contempt.” Everybody knew the whole thing was a joke, except for the great men who bought into their own propaganda. Confronted with this hypocrisy, “it seemed revolutionary to admit cruelty, disregard of human values, and general amorality because this at least destroyed the duplicity upon which the existing society seemed to rest.” Sure, the alternative was farcical, but at least everyone would be able to stop mouthing the same old lies, and that offered a kind of liberation. I think the phenomenon outlined by Shenk is precisely what has allowed Donald J. Trump to rise to the top of our American politics, and why it is far from certain that he won't be elected to a second term in 2020. Americans, I believe, are deeply committed to the kind of democracy that I like to call "self-government," a political system in which the government is both "of" and "by" the people, as well as being "for" them. Being able to participate in this kind of government, more even than economic success, is what I think consitutes the "American Dream." When people see our political "leaders" mouthing the words, while lining their own personal and political pockets, and kowtowing to the corporate interests that siphon off the wealth of the nation into their personal and corporate bank accounts, they loathe the hypocrisy of "the system," and are more than ready to celebrate leaders that openly display their "cruely, disregard of human values, and general amorality." Perversely, it is such "leaders," and our current president is among their number, who seem more credible and honest than the so-called "honest politicians" who denounce our president, but who in fact are not all that different. Do someting about it! Self-government does still work.